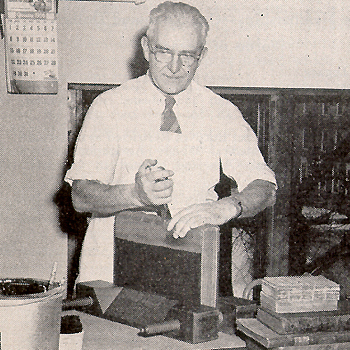 Jean Eschman in his bindery. The National Library of Medicine's Bathtub Collection is an archive of materials found in the old bindings when rare books in the Library were conserved. The materials found in the bindings include fragments of old printed books or manuscript materials which are often treasures on their own. In the Bathtub Collection, NLM has organized and described these fragments and made them available to scholars. The story of the Bathtub Collection begins in the middle of the last century. In the 1940's, The Army Medical Library, as the National Library of Medicine was then known, began a serious conservation program for its rare book collection. The AML hired Dorothy Schullian as curator of rare books and Jean Eschman, a master bookbinder from Switzerland. 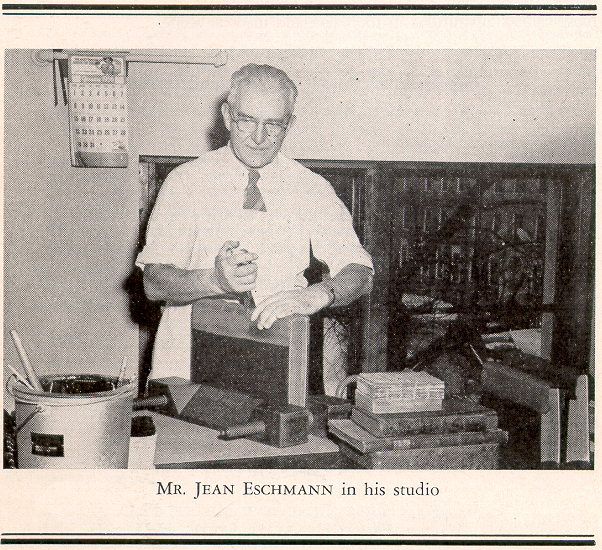 Eschman repaired many of the old bindings and, when he considered them beyond repair, replaced them with new leather covers. Some of the old bindings were kept but many of them were discarded as worthless. Conservation practices have changed since then, and conservators are now much more cautious about replacing original bindings and never discard them.